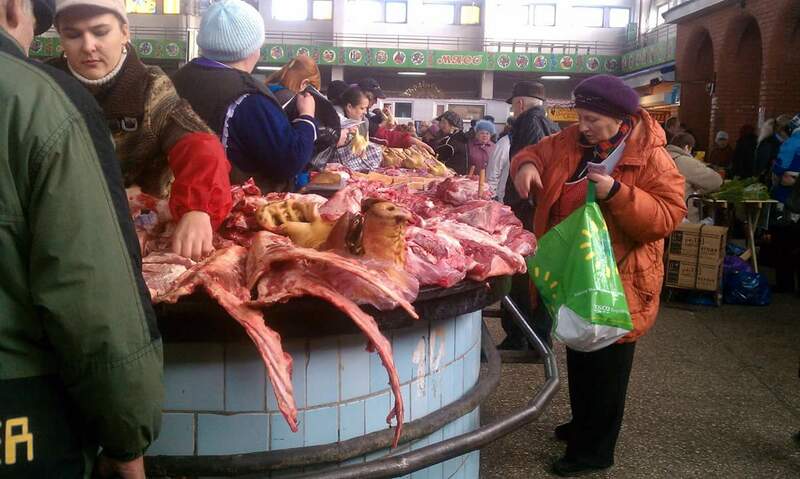 Last post I told you about a meat market in Zhytomer. It was very different. One thing I didn’t tell you is that there was no refrigeration in this market at all. Now if it was winter that would be no problem but when it is summer it gets quite hot in Ukraine. I promised to show you some of the different things they had to sell at this market. The first one is this pig’s head. Now quite frankly I don’t know what you would do with this head or how you would cook it. I’m sure it tastes like some sort of pork but I sure would not want to try it. As far as I’m concerned it just looked sad sitting there. This poor pig lost his head. Then there were the rabbits. 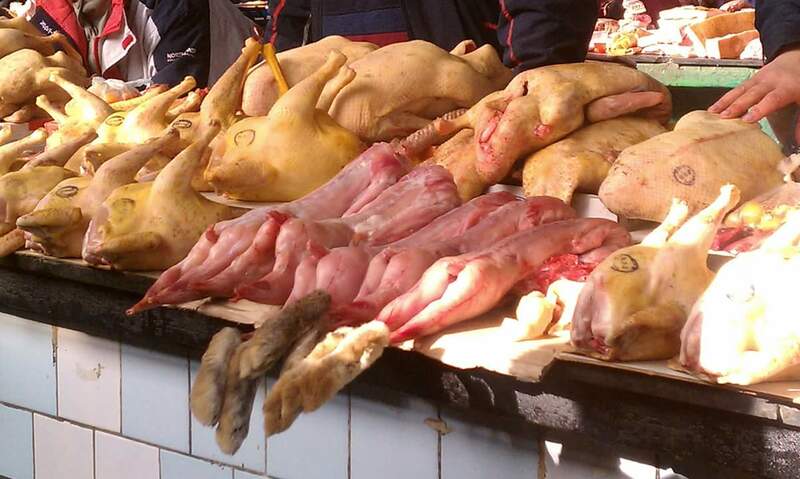 Now I’ve seen rabbit at a good meat market here in the states but they were not laid out like this. And please notice you can buy your rabbits with or without rabbit’s feet. Now why you would want to get the feet with the fur still on them I have no idea. But it must sell over there or they wouldn’t have them for sale. Notice next to the rabbits there are things that look like chickens. I assume they are chickens but maybe they are small turkeys. I really don’t know and since I wasn’t going to eat them I didn’t care. Now this last picture I’m not sure what it is. I assume that it is some kind of fish because fish is quite common over there. But it could be some sort of animal or the inside of some animal. I don’t know and I didn’t ask. 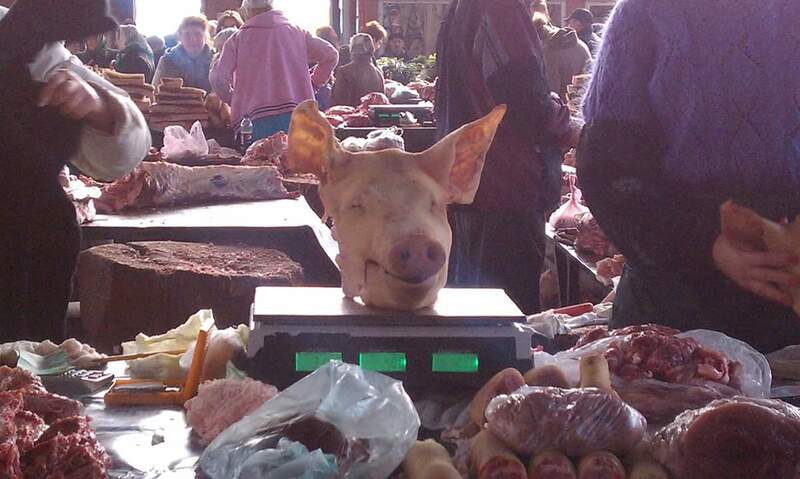 I sure hope you have enjoyed your tour of the meat market of Zhytomer, Ukraine. I have fond memories of that place and a lot of times I chuckle when I go to the deli department here and find all the workers with hair nets and rubber gloves.